Want to slow down, live in the moment, and truly enjoy the winter season? 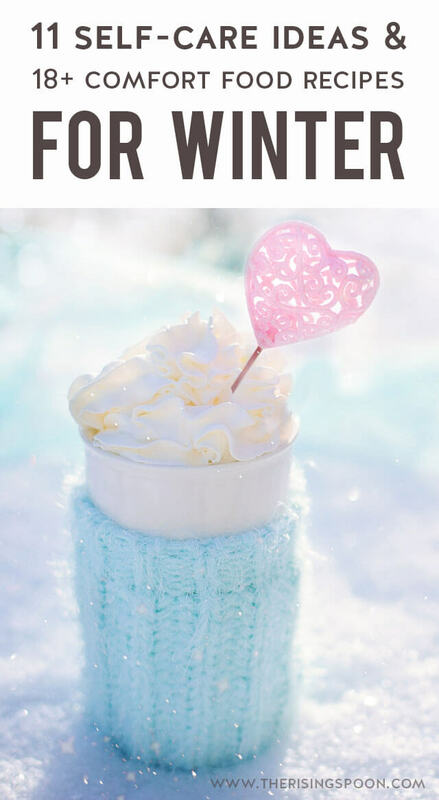 Check out this inspiring list of winter-themed self-care ideas and comfort food recipes from some of my favorite blogger friends. Add a few to your weekly routine & you'll be feeling relaxed and nourished in no time. Last fall, I began a 4-part Seasonal Self-Care Series to share healthy activity ideas for each season of the year. I hope these posts remind & inspire you to STOP the busyness, purposefully slow down, and prioritize yourself on a regular basis. 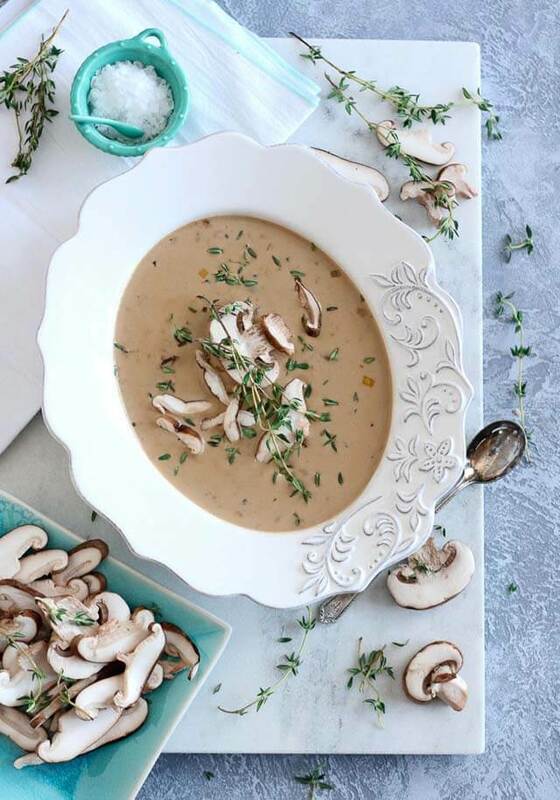 Of course, comfort food goes hand in hand with self-care so I'm also including recommendations for specific foods or drinks that are best consumed during each season. I consider yummy food that sings to your soul a necessity. Today I'm sharing Part Two, which focuses on the winter months. Following the winter solstice and spring equinox, winter officially runs mid-December to mid-March. However, there are parts of the country that stayed buried in snow until late April or early May. If you're one of those folks experiencing six months of winter weather (even if the light is slowly increasing), it's vital to take care of yourself--both physically and emotionally. One region in the world knows how to do this better than anyone--Scandinavia (Denmark, Norway & Sweden). These folks get six months with barely any sunlight, then another six months with hardly any darkness. Talk about extremes! I've visited Norway several years ago (the fjords were absolutely stunning) and experienced the never-ending summer daylight. At first, it felt odd waking up in the middle of the night and cracking open a thick drape only to peer out into brightness. But I quickly adapted and actually left Norway craving the midnight sun. The flipside of this plethora of light is the months-on-end darkness. Seems pretty daunting for us sun bugs, eh? Well, folks in the far north have learned to welcome this cold & dark period by embracing something called hygge (Danish) or koselig (Norwegian). Both words roughly mean "cozy", and describe a feeling or moment of warmth, comfort, and happiness. Sounds perfect for winter, right? To foster this feeling, you focus on creating a home environment that allows you to slow down and bask in the small, everyday pleasures of the moment. Maybe that's draping yourself in a chunky blanket and reading a good book. Or sipping on a hot (spiked) beverage while outside chatting with friends. Or fixing a hearty stew in a kitchen surrounded by candles. The best part is hygge doesn't involve buying anything. It's a feeling, not a product. So, you can achieve it using things you already own and love. Here are 11 simple self-care activities you can implement during the winter months of December through March (or even further into spring if it's still snowy in your area) to facilitate relaxation and keep you grounded in the present. Woodburning fireplaces generate much-needed warmth, but also provide a trio of ambient light, white noise (hiss, crackle, pop), and earthy scents that combine to create the ultimate relaxing environment. Don't have a fireplace in your home? Play the audio on this fireplace Youtube video (keep the screen turned off) to mimic the cozy sounds. Use these quiet, slow months to reflect & brainstorm what you'd like to achieve in the next 3-6 months. To avoid overwhelm, keep your list short & specific, then break those bigger goals down into bite-sized tasks you can hammer at every day or week for small wins and progress. 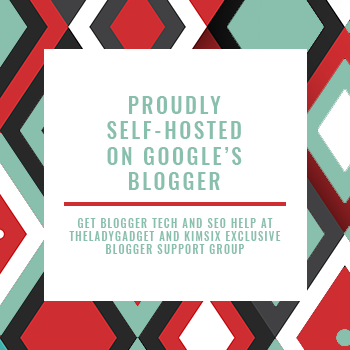 Are you a fellow entrepreneur in the online space and need some help with content strategy, time management, and goal setting? Go stalk Kirsten Thompson of Wit & Wisdom. :) This lady knows her stuff & I highly recommend her blog posts, newsletter list, facebook group & paid courses (I've taken two so far). In a world that's seemingly digital everything, it's refreshing to use tangible things like playing cards or board games, especially when you're going to be stuck inside anyway. These are active, social games that keep you in the present moment as you hold or move plastic/metal/wooden/paper pieces, follow the rules, strategize your next move, and shoot the breeze with your competition or team members. Grab some tasty beverages + snacks and enjoy a few hours of pure, simple fun. Don't own any board or card games? Here are some of my favorites: Jenga, Exploding Kittens, Monopoly, Yahtzee, Pandemic, Scrabble, and Space Hulk. Baby, it's cold outside. So, you might as well crank up the oven, get your blood flowing, dirty every single bowl & measuring utensil in your kitchen, and manage to spill dry ingredients all over the counters & floor. Maybe that's just me. Try a few of my favorites: Flourless Peanut Butter Cookies, Healthy Banana Bread, and Cherry Turnovers with Homemade Cherry Pie Filling. Wrap yourself up in lots of layers, including a hat, scarf, and warm shoes, and go walking. The combo of brisk air, stillness, and bare skeletal-like tree limbs contrasted against gun-metal gray skies is hauntingly beautiful and peaceful. Bonus points if the ground is covered in snow so it feels like a winter wonderland. Unplug. For realsies. Turn those devices OFF (not vibrate or silent - that's still a temptation) and put them away. It'll help your attention span and let you enjoy the present moment. Use candles to create relaxed ambient lighting in all your rooms to make the long, dark nights more enjoyable. Beeswax candles are the best for this and SO worth the extra cost. Why? First, burning them actually purifies the air (much needed in the middle of winter when you can't throw open every window for hours on end). Second, they last WAY longer than those cheaper mass-produced candles made with soy, paraffin, etc. I never believed this until I actually tried it myself, which took years because I was being a stubborn cheapskate cool person. Third, they give off a lovely light scent and contain no toxic synthetic fragrance. Like #3, handwriting a letter is a personal, physical act that anchors you in the present moment. Spending 20-30 minutes to write a letter to a friend or family member, then sending it via snail mail will make them feel extremely special & appreciated. In our busy lives, time is the most valuable commodity, and when you take that time to write a letter or craft a DIY gift, it sends a big message: you matter to me. And that feels really good for both parties. You know, the one that you've been meaning to read for-evah and keep putting it off. Or it's sitting all lonely-like, half-read on your nightstand. My nightly winter routine the past two months has been an Outlander book (I'm currently on book 4 in the series) + a Warm Blanket + a mug of Hot Herbal Tea (like Nighty Night & Nettle Leaf) + a Crackling Fireplace and it is absolute bliss for an introvert like me. Now that I've shared my self-care tips, it's time to make you super hungry for comforting food! 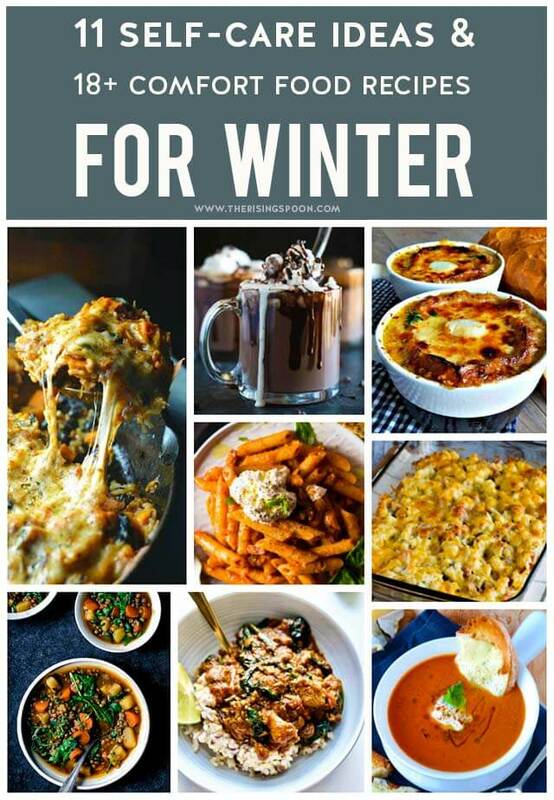 I've rounded up 18 warm dishes from my food blogger friends (and a few from me) that will keep your belly & soul happy in the winter months. 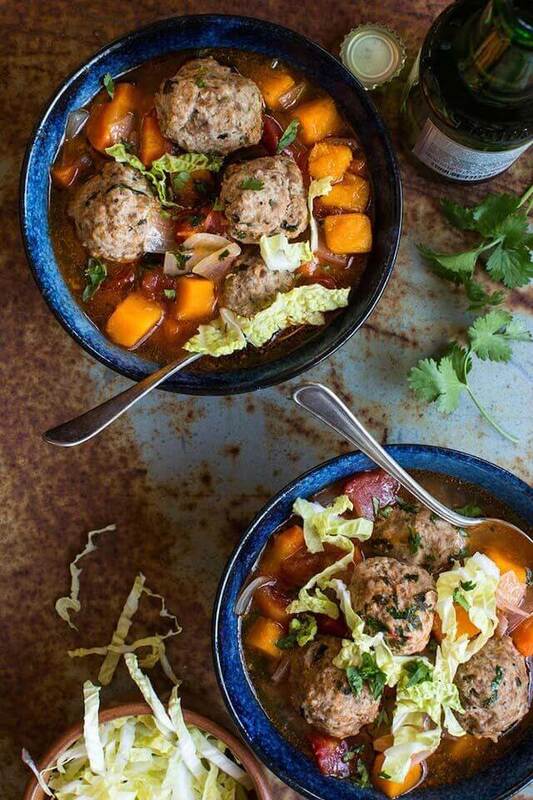 Alexandra says: "I always turn to soups and stews if I'm stressed or sick, and this is my favorite comforting winter meal. 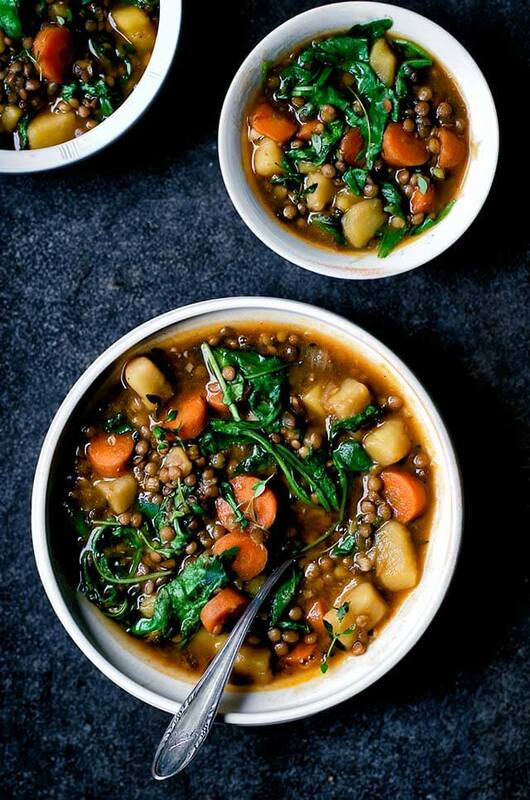 It's a reminder of the kind of food I grew up eating and with plenty of veggies and lentils, it's a nice cozy meal without feeling heavy." Kalyn says: "This Low-Carb Ham and Cauliflower Casserole au Gratin is one of my absolute favorites when I need some cold-weather comfort food. 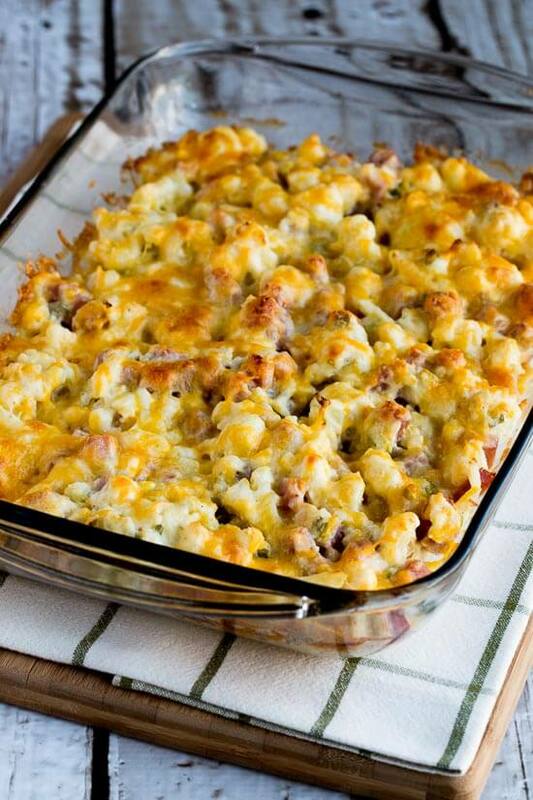 This tasty casserole is cheesy and loaded with flavor, and if you're lucky you might have some leftovers for another meal!" 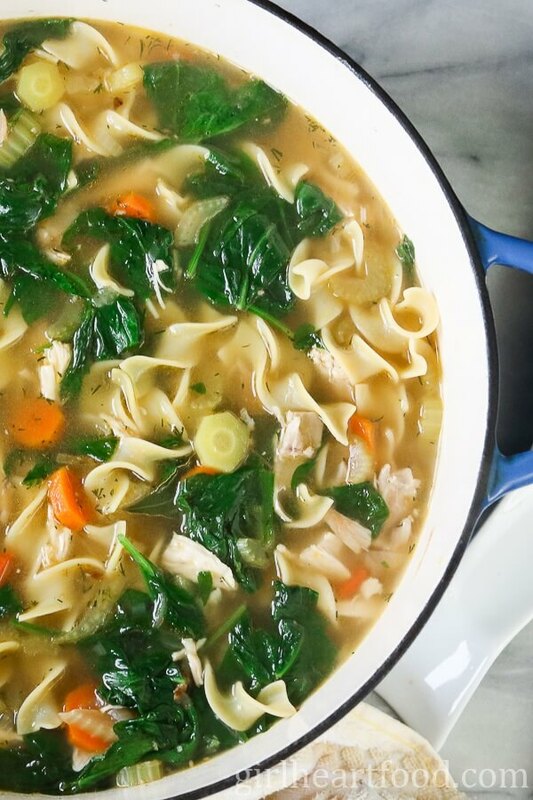 This recipe uses a whole cooked chicken, as well as fresh veggies & herbs, all of which add a ton of extra flavor to the soup & make it taste like a cross between traditional chicken noodle soup and chicken pot pie. 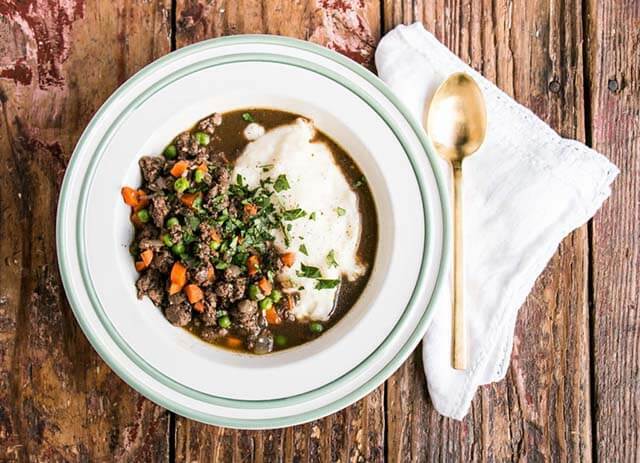 It's creamy, thick & hearty--perfect for any time you're craving comfort food or need a hot meal to warm your belly. 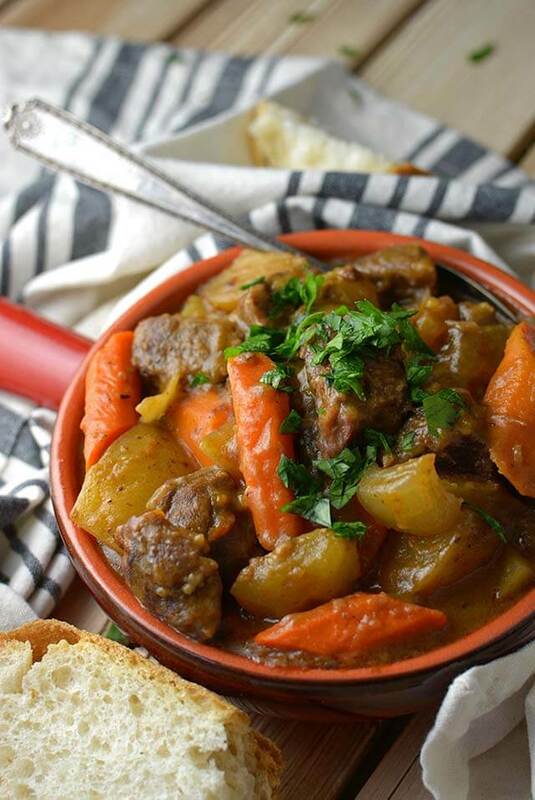 "Slow Cooker Beef and Vegetable Stew – Fill your home with the inviting smell of a warm, savory stew all day long – without the hassle of watching it all day long!" 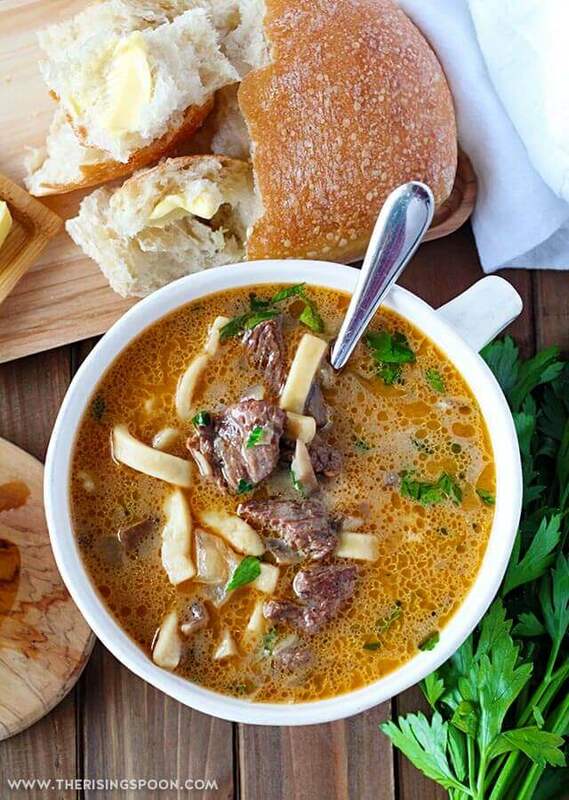 Linda says: "Nourishing broth, winter vegetables and fresh herbs make this a favorite cold weather soup!" 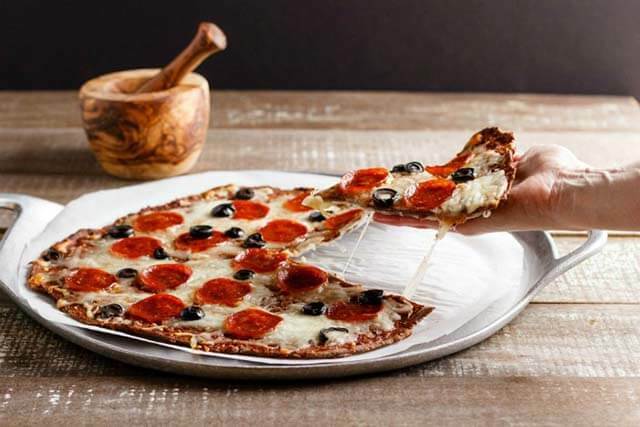 Stacey says: "[This] is a yummy, gluten free, low carb, keto pizza that has a thin, slightly crisp, but sturdy crust. Finally, a crust that is low carb and much like the kind at a pizzeria." Yang says: "Lamb is a top nourishing and warming food for winter from Chinese medicine’s perspective. Curry spices such as turmeric, ginger, cinnamon are warming and healing at the same time. When [the] temperature is cold outside, eating foods that stimulate warmth within is key to keeping our health in balance." Homemade tomato soup is one of my favorite comfort food meals. Pair it with several slices of toasty cheesy bread for dipping & I'm in heaven! 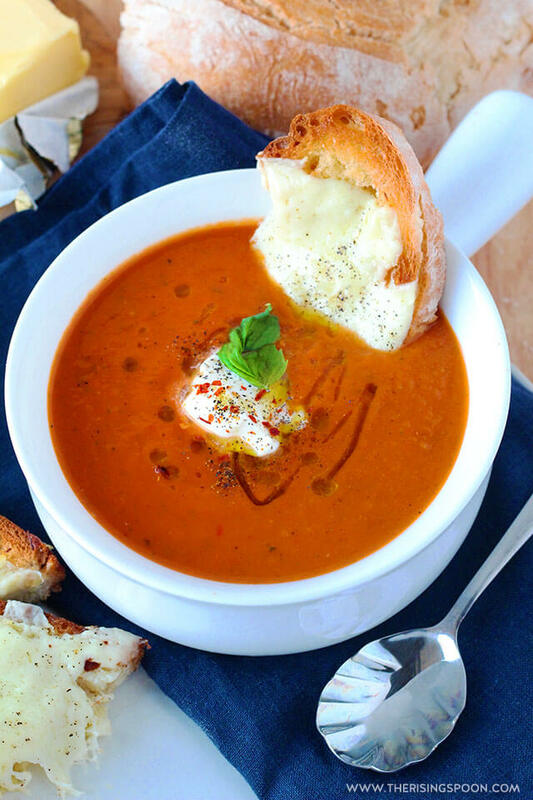 My recipe is made with simple ingredients like canned tomatoes, fresh basil, and carrots, which results in a light, yet cozy tomato soup that you'll want to make on repeat all year long. Bonus: it only has 10 minutes of prep! The Gals Say: "I live in the Bold North (Minneapolis) and when the temp dips below zero, which is often does, I need food that is warm and hearty. 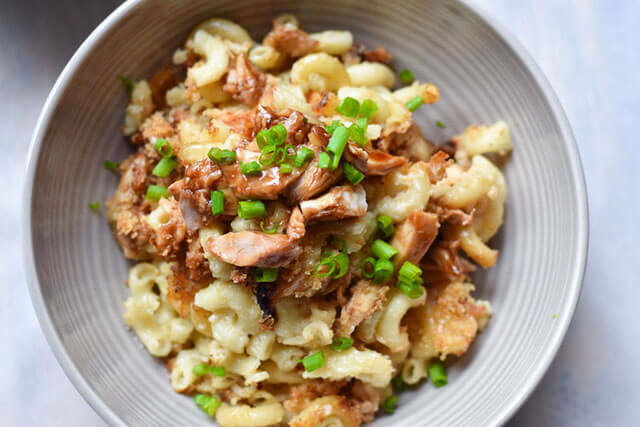 This BBQ Macaroni and Cheese is a favorite of adults and kids alike"
Dawn says: "Homemade chicken noodle soup...a classic this time of year and one of my faves. The broth is infused with dill and there’s lots of chicken and veg. Love it!" 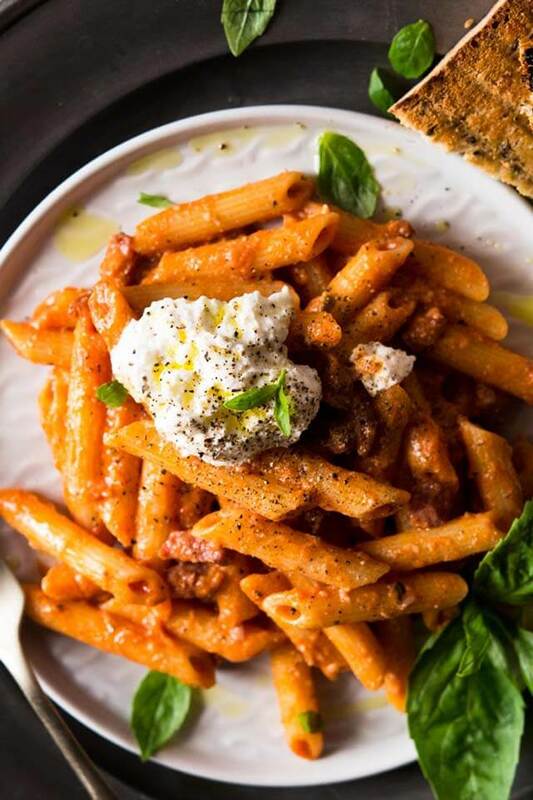 "Delicious penne pasta with pancetta, ricotta cheese and a simple yet flavour packed tomato sauce. This pasta recipe is so easy, comforting and can be made in around 15-20 minutes. Serve this in large bowls with toasted garlic bread and salad." "This Homemade French Onion soup is simmered in red wine, beef, and chicken broth. Then topped with toasted crusty bread, gruyere cheese, and some scallops. 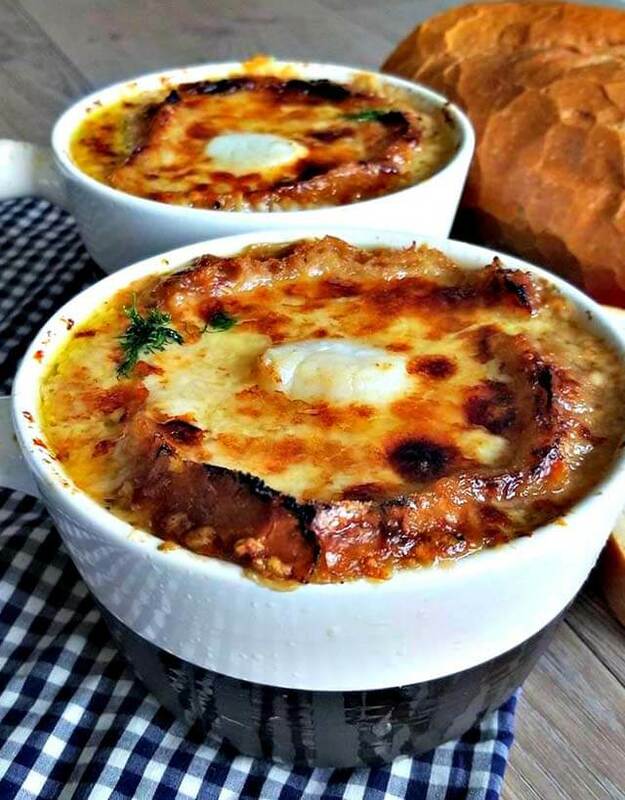 You're going to want to get yourself a set of some good quality ovenproof bowls and then you will be in business to make the best french onion soup ever." 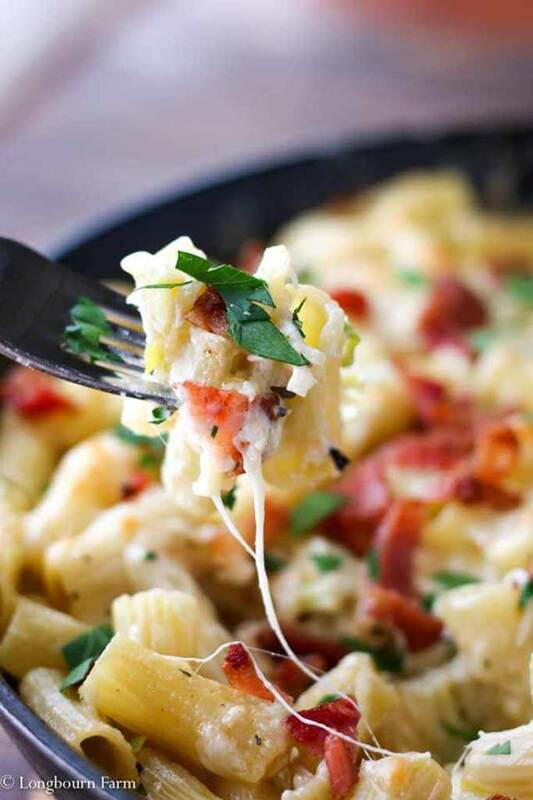 Alli says: "[This] is cheesy, easy and completely homemade. 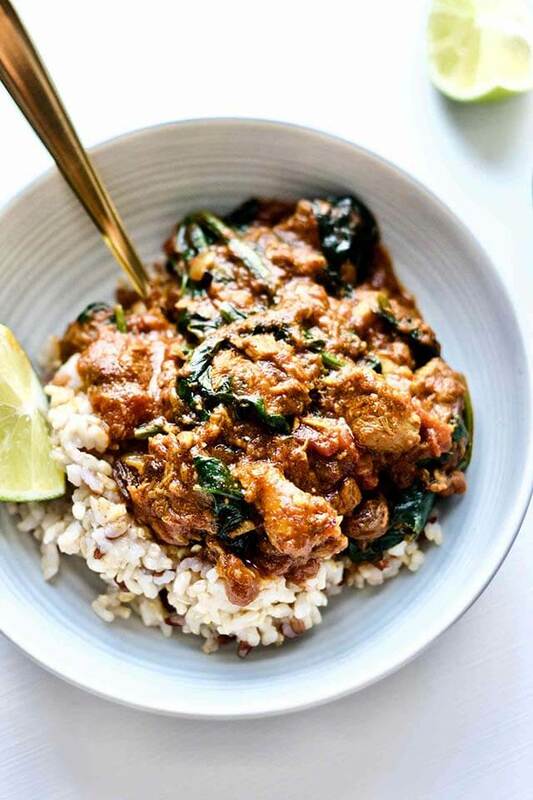 It’s perfect comfort food because it’s packed with flavor but uses minimal ingredients so it’s low stress." 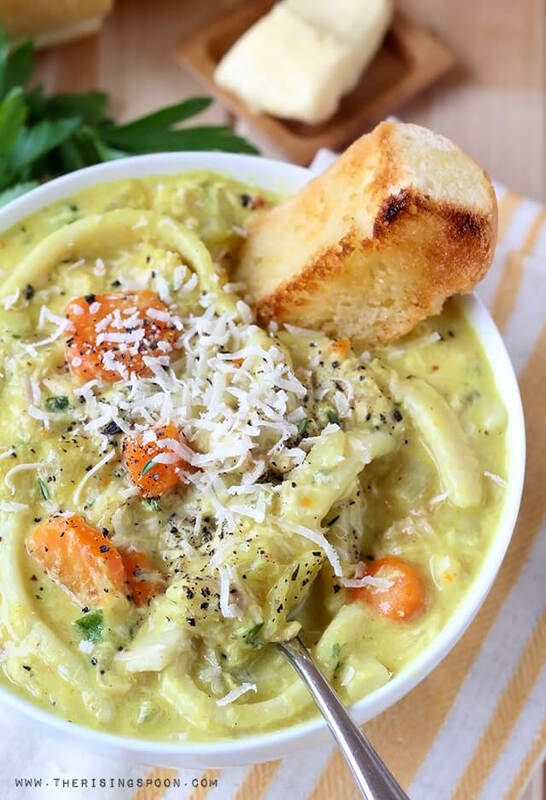 This savory soup is made in one pot on the stove-top using simple ingredients in about one hour. Each spoonful is packed with tender beef, earthy mushrooms, fragrant onion & garlic, thick & hearty noodles, and a rich, slightly creamy & savory broth. This is simple comfort food at its best! Fix a batch any time you're craving a delicious stick-to-your-ribs meal that'll keep you warm. Jenn says: "For me, it's all about soup and about making sure I have healthy food to eat all week at lunch, so I don't grab something unhealthy or forget to eat at all. This is one of my favorites!" Samantha says: "Cozy, comforting and smells like something grandma would make." 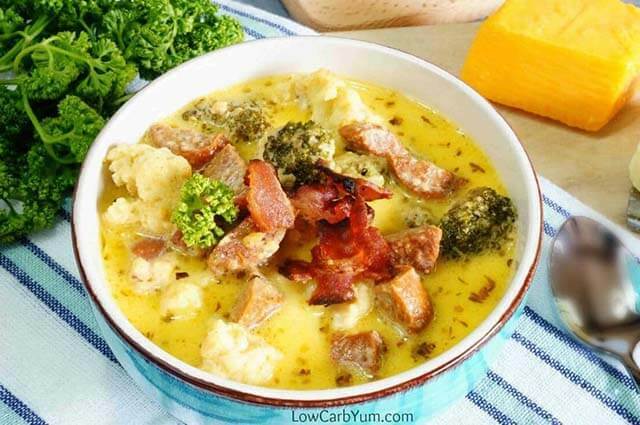 "A hearty broccoli cauliflower cheese soup loaded with chunky add-ins. Using a few varieties of sausage as well as bacon really ups the flavor!" 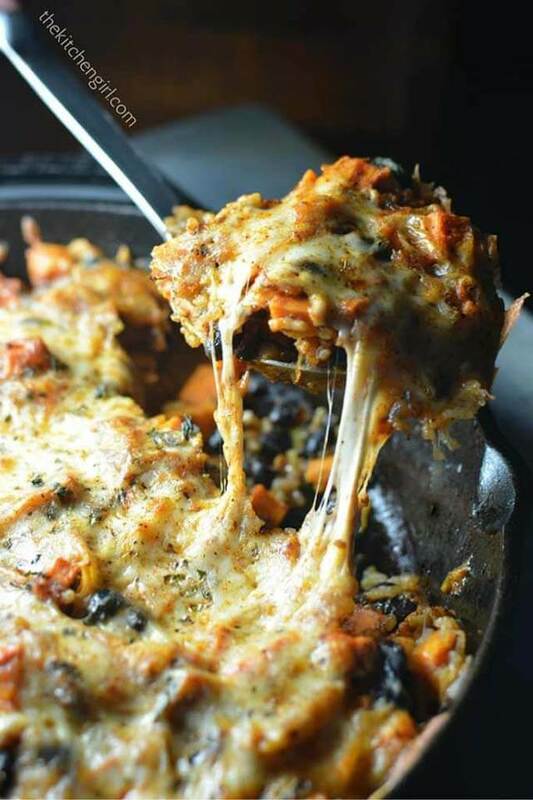 "Vegetarian Skillet Enchiladas [are] my deep-dish, gluten-free, comfort-food paradise. Check out that pull-apart cheesy goodness on the top with loads of healthy ingredients underneath." 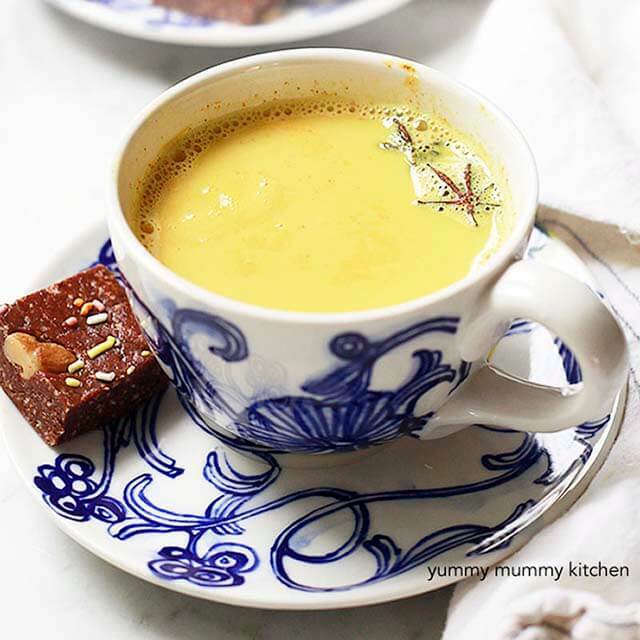 Joanie says: "This healing Ginger, Turmeric, Cinnamon Tea is full of immune-boosting spices. Used to halt a cold or speed up recovery. 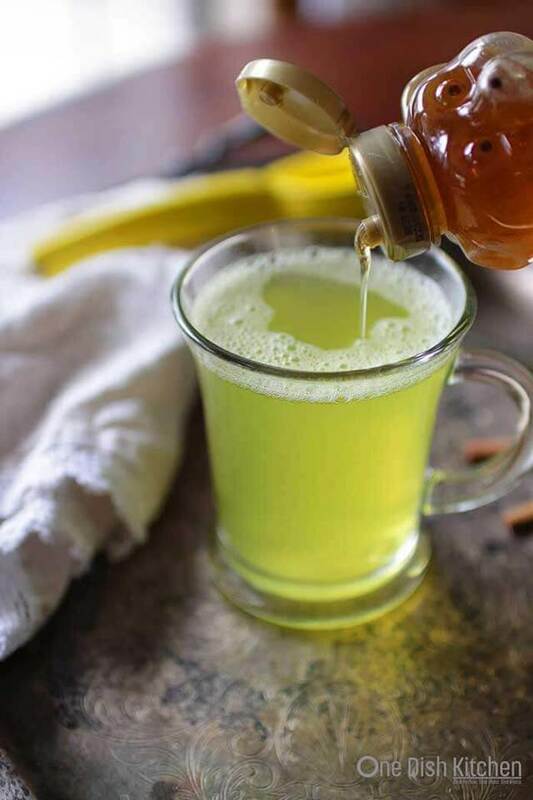 Made with fresh ginger, turmeric, cinnamon, lemon juice and sweetened with a touch of honey. Spicy, sweet and comforting." 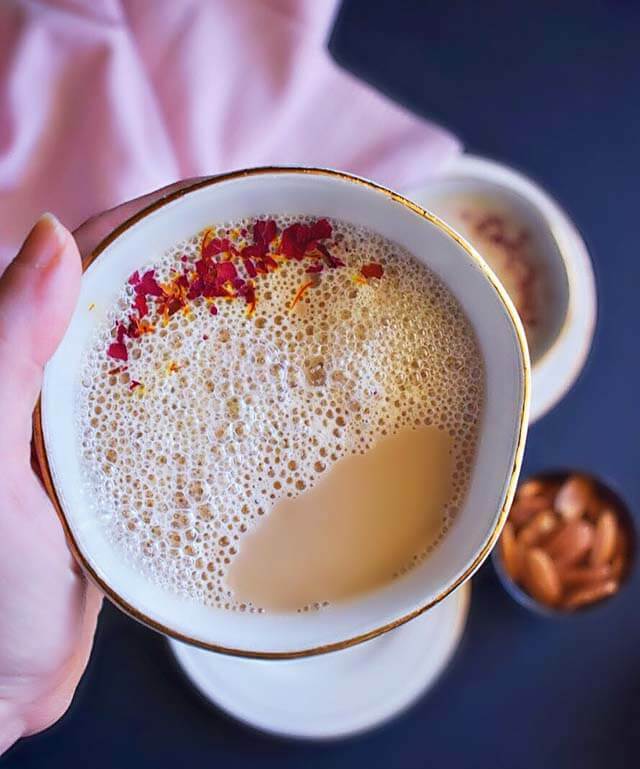 Marina says: "Golden Chai Spiced Turmeric Lattes are the perfect way to add some sunshine and nourishment to your cold winter days!" Kelly says: "In winter, it seems like everyone is sick. 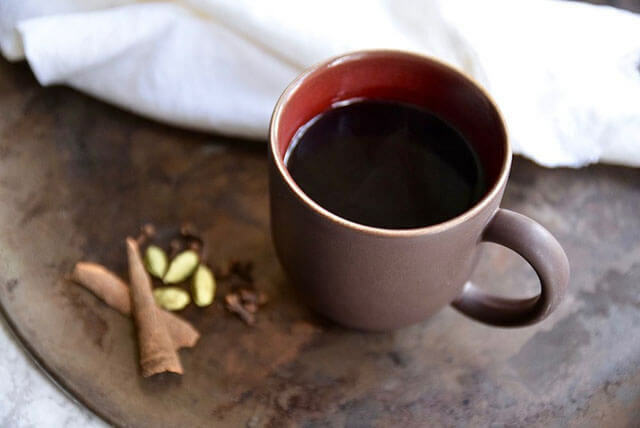 When I see people start to fall ill around me, I reach for this immune-boosting elderberry tea. It keeps me healthy and feeling strong!" Emily says: "When it comes to self-care and needing a little extra love, two things always come to mind - warming drinks and chocolate. 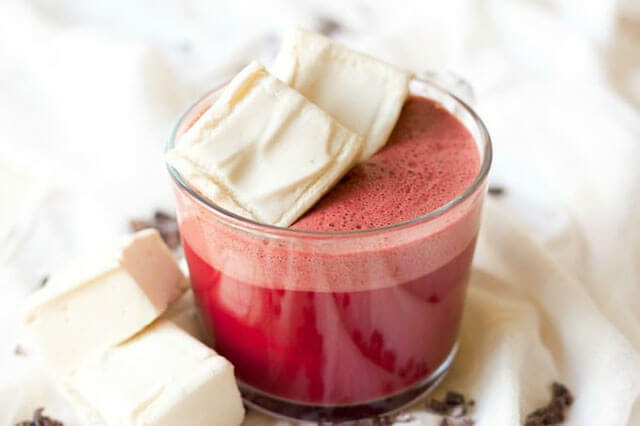 This healthy Sweet Beet Hot Chocolate is a fun twist on the traditional warming drink. 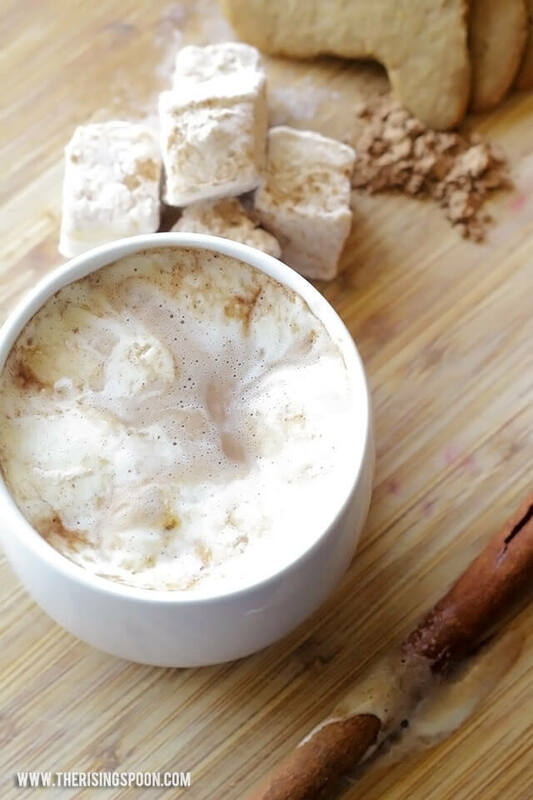 It's a bunch of nourishing love in a mug and perfect to cozy up with." Molly says: This is a "healing and deliciously aromatic tea that’s a mix of soothing spices, rose, and saffron. The ‘chai tea-mix’ or ‘chai-masala’ as called in India is made at home and can be stored for months. Perfect to serve on Valentines or a special occasion." 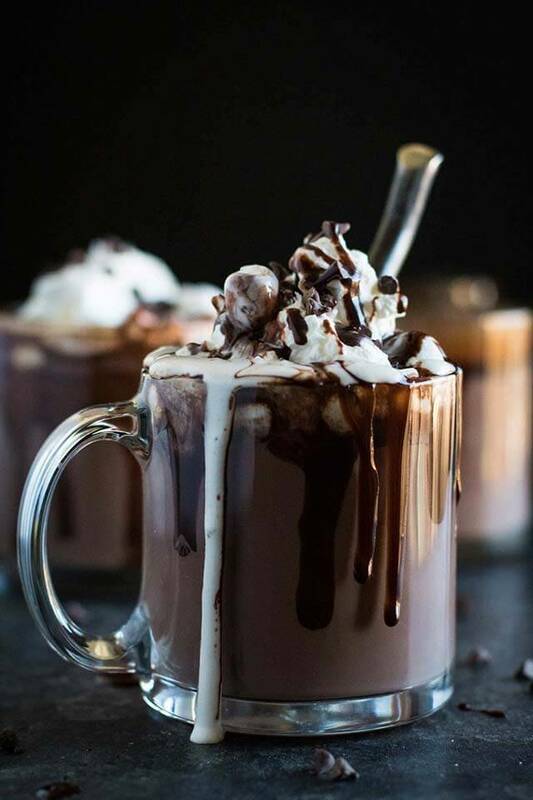 Mikaela says: "Thick hot chocolate is my go-to winter splurge. Everything about it to me signifies warm and cozy and being curled up in front of the fireplace with a blanket and watching the snow come down! My winter heaven!" 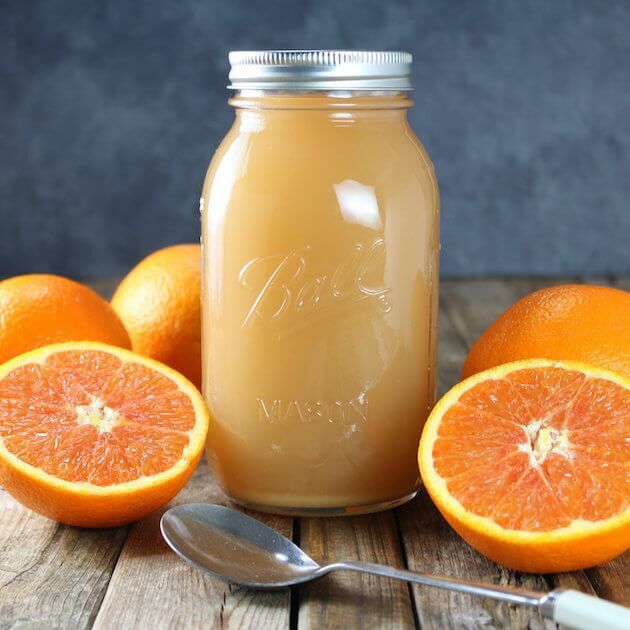 A powerhouse mixture of vinegar, onion, garlic, horseradish, ginger root, and fresh herbs to support your immune system through the winter months. Also works as a tasty salad dressing. 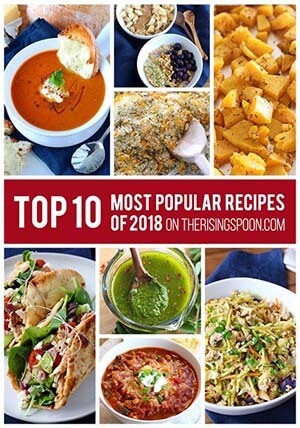 Click Here To Pin This To Your Comfort Food Recipes Pinterest Board!